My friend Mike took a trip to the Grand Canyon with some friends. They decided to stop near the south rim visitor center. 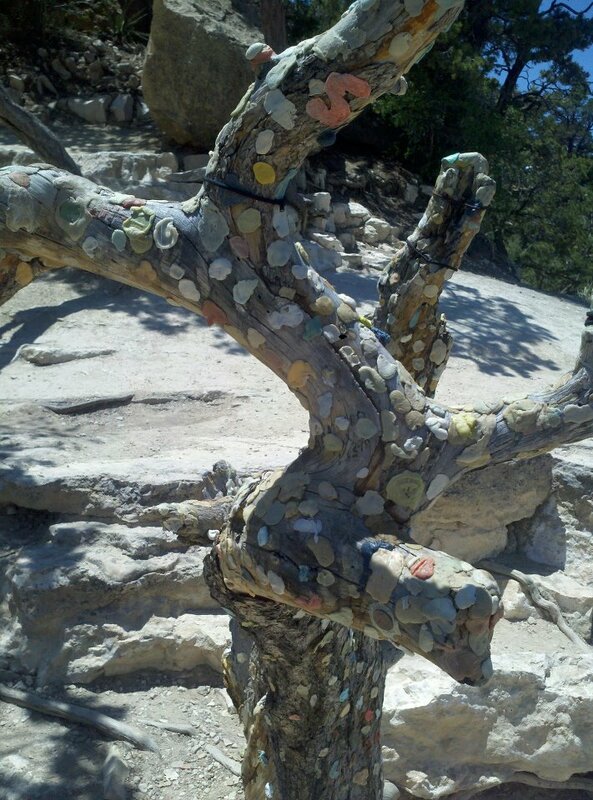 While hiking on a hidden path and climbing down near the canyon, they saw this tree with a bizarre amount of discarded chewing gum stuck to the trunk. I just don't know what to think of this. You'd never find that in Singapore. It was a very random find too because it was over a fence and down a ways right by a cliff. It's bizarre when you think about it. One person put their gum on it and apparently it just started a trend. Still though, it was neat. I like it when we find the weirdest stuff in the most obscure places. I need to hike around places more often. Thanks for the pictures. I dare you to pull one off and chew it. Oh, I will.........NOT! So gross! 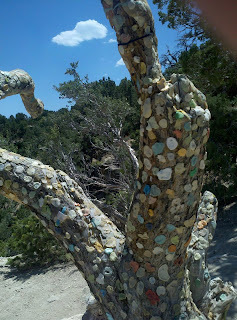 Just for grins, I googled "chewing gum tree." Along with pix of the chicle tree, from which we get gum to chew, I also found images of a number of trees which have been treated to the reverse procedure. One of them is reportedly in "in the garden of the National Museum of Anthropology in Mexico City. The visitors made an modern art object by leaving their colorful chewing gums on the trunk." (http://www.nowpublic.com/chewing-gum-tree) So, I guess if you can think of it as an art form rather than arboreal vandalism, your day might be just a teensy bit brighter. Also, still looking for the silver lining here, every wad of gum stuck to a tree might be one less stuck to the bottom of a shoe. OTOH, thinking about shoes reminds me, the pic you posted was taken in the freakin' Grand Canyon National Park! What about "take only pictures, leave only footprints"? LOL, I like that! Actually, Mike thought it was pretty neat. It does look like a work of art. You have a point, I would not want to step on the gum. Yeah when I saw that tree it did kind of look like something you would see in some obscure art museum. Like, there was a point to it or something. It was just this one little dead tree covered in gum. It rests a few feet from an edge to a very very long fall. There were other trees around it, but this was the only one with gum. Very cool, if not very infected with numerous diseases.